The Beijing Culture and Art Center, which opened in January in the heart of the city, doesn't see itself as an up-end art space, but rather as a "back garden", where residents can gather for chats while enjoy interesting shows and their children can participate in a variety of programs after school. 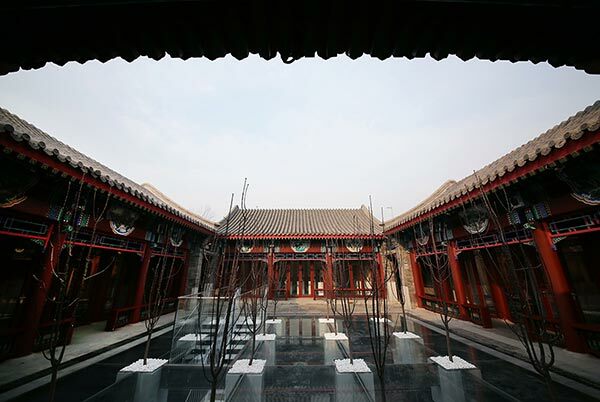 Hosted in a traditional courtyard house, the institution is staging exhibitions to share with visitors links between the past and present, its director, Cui Qiao, says. The ongoing inaugural exhibitions, running through March, include the Muji Award 04 in China that displays award-winners of the Japanese brand's fourth-edition design competition and Muji's poster collections; Skeleton-Infill, which shows architectural designs for the public good; and Saving Face, a multimedia installation that discusses interactions between people and cyberspace. Along with the contemporary art displays is The Power of Silence, a show of Tibetan thangka paintings. The architecture of the art center is itself an interface to connect traditional style to modern design, and art to daily life, according to Japanese architect Sou Fujimoto, who led the center's transformation and design work. The center is located in a hutong (alley) right next to the famous Yonghe Lama Temple and Guozijian, the Imperial College. The alley is a melange of bars, galleries and cultural institutions, and is home to many Beijing natives who account for the majority of the neighborhood's population. Fujimoto's major task was to integrate the courtyard's ground area with its underground space. He designed a "floating forest" by replacing the middle of the square ground with a glass floor on which four rows of trees are planted in crevices, and added stairs that lead visitors down to the underground exhibition area. "I'm impressed by the nostalgic feeling combined by the beautiful roofs and quiet atmosphere (of the hutong)," he says in a video message that is played at the center. "It (the "floating forest") brings artificial nature into the courtyard, creating harmony between old style and new nature." On entering the center, a visitor is surrounded by the classic courtyard and trees, offering a sense of immediate calmness. Then the person slowly discovers the underground space. The two spaces combined create an openness that allows people to feel the area's rich variety and to do things they like, Fujimoto says. Cui says more cultural programs and facilities will be designed to cater to people's practical needs. This will include a community library, where schoolchildren can play, read and develop their interests in the time after school and before dinner－the center stays open until 8 pm from Tuesday to Friday and until 9 pm on weekends. Volunteers at the site include elderly residents who can recycle their previous experiences in life and at work. "Our city neighborhoods lack community spaces for residents to not only play xiangqi (Chinese chess) but also－more importantly－for people to mingle. "This is what we can do at the Beijing Culture and Art Center－one can feel the pulse of China's grassroots communities," Cui says. 10 am-8 pm, Tuesday to Friday; 10 am-9 pm, Saturday and Sunday. 3 Wudaoying Hutong, Dongcheng district, Beijing. 010-8408-4977.